If I prefill some fields with url parameters, I'd like them to be read only, so that the user cannot change them or clear them using the clear form button. Obviously if the fields are not prefilled then I want them to be editable and clearable in the usual way. 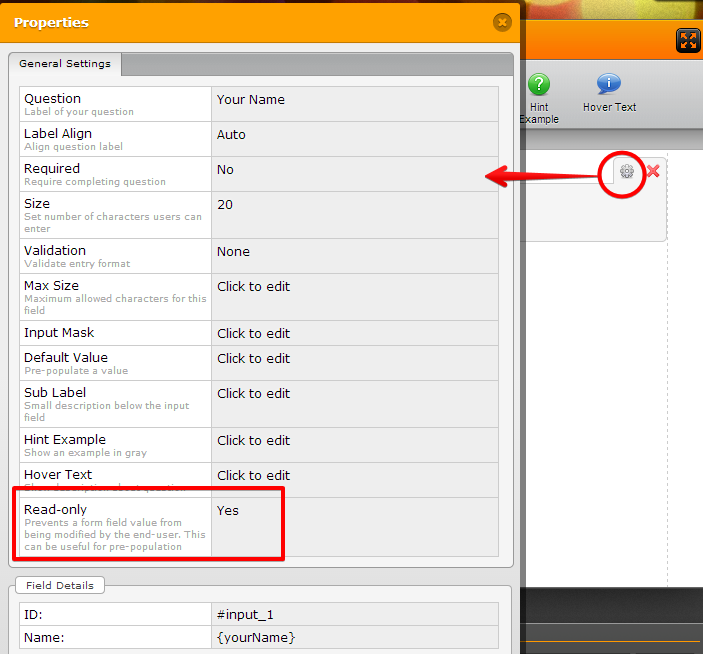 You can set the Read-Only property to YES in the field properties option. Thanks, but that is not really what I want to know. Yes a field can be defined as readonly, but what I want is that the field should normally be read/write, but if it is filled from a URL parameter, then it should become readonlyso that the user cannot change it, and hopefully clearform would not clear it. That would be incredibly difficult to achieve, being that a URL prepopulation functions the same as a user would in filling the form. But Your request is understandable. Are the prefill values a variable or fixed? - Please share your prefill URL and we can consider a workaround. What I wanted to do was to prepopulate some fields on some occasions when calling the form from another form. In particular I wanted to use some of the settings in one form to get the thank you page to configure itself accordingly. I think that I have found my own workaround. I can put hidden fields onto the thank you page. The URL line to call the page can set values for these fields, and the page can use rules based on these values to decide what to show. It appears that the clear form button does not clear hidden fields – so I can achieve my object.